Tuned Global have partnered with a number of leading brands and labels who have used the #PowerOfMusic to engage customers and drive positive business impact. 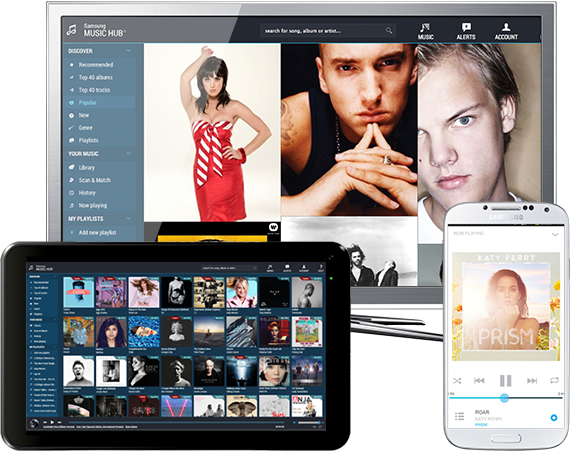 Music Hub was a full music streaming service across all Samsung Mobile & Audio Visual devices from 2011 to 2015. It was a huge product differentiator for Samsung Australia that helped to drive customer acquisition and increase loyalty. Music Hub had more paid subscribers in Australia than all other Samsung music services in the rest of the world combined! Provision of all APIs and infrastructure to drive the service, including search, user management, curation, suggestions, playlist management and billing integration. The project was completed in 4 months and was nominated for the Australian Choice Awards for Streaming Platforms in 2014, for ease of use and power. It was also the #1 Music app in term of downloads on the Samsung Apps Store. JB Hi-Fi took advantage of the emerging streaming space to attract and retain customers at a time when physical sales were falling. 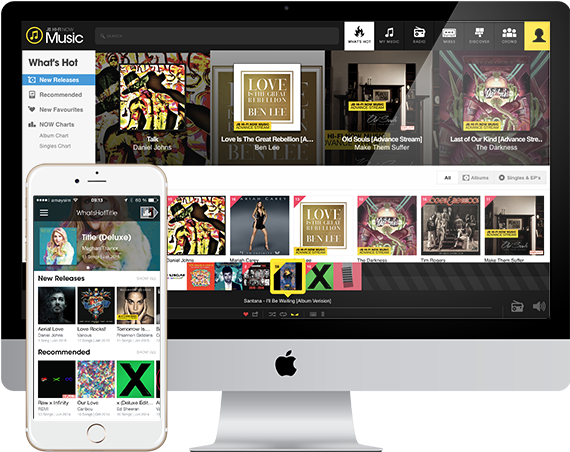 The iconic Australian company offered its music-loving customers an innovative music platform from a brand they already trusted, curated by a dedicated internal team of music experts. The project was completed in 6 months and was nominated for a 2014 ARIA Award in the Outstanding Digital Service Category. Reward customers with a week of free music streaming if they purchase specific products. You could also send them personalised offers on their mobile at any time, based on their location or their activity. Whenever a customer spends money at your petrol station they earn points that can be redeemed for music giveaways or listening sessions on your brand's mobile app. Reward your most loyal customers with free music all year long. Create stations for specific activities or classes (like yoga, running, stretching) for your VIP customers or renewing members to tune into. Give new customers free music on your mobile app, to promote a new account or credit card. They’re rewarded with extra music offers for continued spending, and in exchange you will get to know them better! Line Music is integrated into Japan's # 1 Instant Messaging service (60 Million users / month). LINE was searching for an experienced music technology company with strong music label relationships and a robust and highly scalable platform. 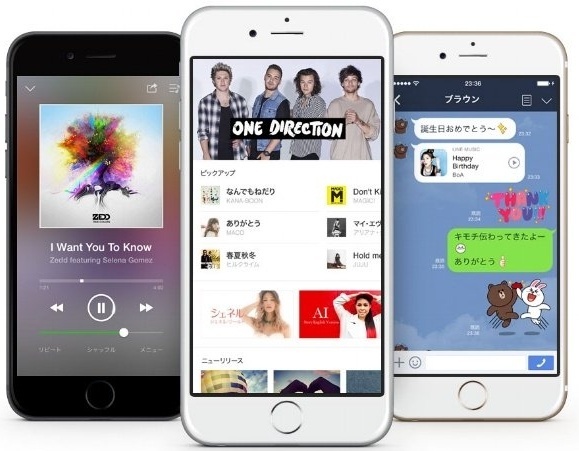 The task was to ingest millions of tracks quickly to increase the International content offering for the 220 million MAU (Monthly Active Users) of LINE MUSIC in Japan. Tuned Global was chosen as the preferred partner due to a proven track record in fast delivery and strong capability to execute digital music solutions. Nada Kita is a smart music streaming app available only in Indonesia. 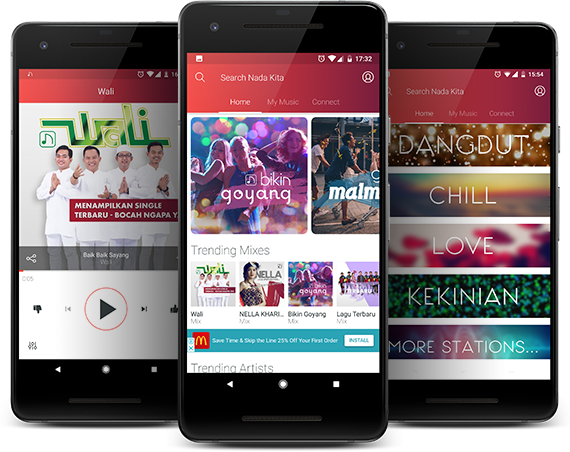 It allows Indonesians to easily listen to their favourite local music for free without using a lot of mobile data. Offering over 150 mixes of various moods, activity and genres, the app is curated by local music experts. Created and co-owned by Tuned Global and 6 major Indonesian music labels (Aquarius Musikindo, Musica Studios, My Music, Nagaswara, Trinity and VMC), Nada Kita connects brands to users via advertising, sponsorship and partnerships. Nada Kita is a real-life lab for Tuned Global. This direct to consumer service allows us to test and learn tactics in order to better innovate and support our B2B clients. Nada Kita has attracted over 2.5 million Indonesian users since it launched 2 years ago.